In our last site diary, we went into more detail about the Western area of the site and how the preservation conditions there vary from the central section of the settlement. For more information on this, or the layout of the site in general, please refer to the earlier diary entries: “Exploring the Western Area of the Excavation” and “A Tour of the Excavation” Part One and Part Two. In this diary we are turning our attention to the opposite edge of the excavation and exploring the small, but no less important, Eastern Area. Looking at the eastern end of the excavation couldn’t be much more different to the western area of site. 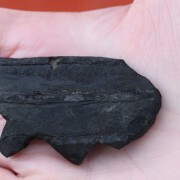 While the western end has relatively little wood remaining and is much drier, the east is very damp and has a dense amount of well-preserved wood and construction debris. 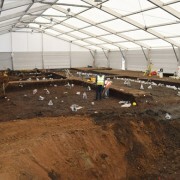 The eastern area is the smallest section of the excavation, consisting of a narrow strip down the very edge of the site. It runs parallel to the 2006 evaluation trench and contains archaeology related to the palisade and a small portion of Roundhouse Five. When excavating in this area we have faced a different set of challenges, predominantly concerning water. 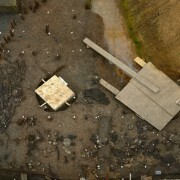 The eastern section of the site has been consistently wet with water often running in from the edges of the warehouse. This constant presence of water has been ideal for keeping timbers wet but makes it very difficult to carry out the necessary, delicate archaeological work. After some modifications to our strategy and the creation of a sump close by in a sterile location, we were able to work a little more comfortably. Image showing early excavation to uncover the burnt debris and the palisade in the eastern area of the settlement. In the foreground is one of the areas of animal and human footprints around the outside of the palisade. There has been a real contrast to the archaeology outside and inside the palisade in the eastern area. Outside the palisade has been largely devoid of material, aside from very occasional, small pieces of timber. However, there are dozens of foot and hoof prints impressed into the soft silts of the roddon. The soft mud retained the shape of the print after it was made and, over time, the shell-rich river sediments filled the indentations preserving them for over 3,000 years. 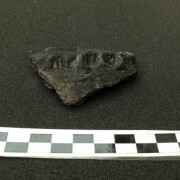 We are investigating the dating of these impressions at the moment and, interestingly, it is possible they were made after the settlement was destroyed by fire. Contrastingly, inside the area of the eastern section is a dense cluster of exciting archaeology. Initially we were unsure of what we would find, given its closeness to the very edge of the settlement and its relatively small size. 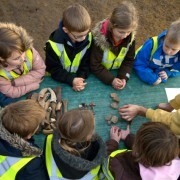 Yet, as soon as we began excavating we were delighted to discover some really well-preserved archaeology alongside a few rather unusual elements. While there were fairly typical elements of the wood mass deposit, including some large structural timbers, we also discovered some more delicate elements of Roundhouse Five. 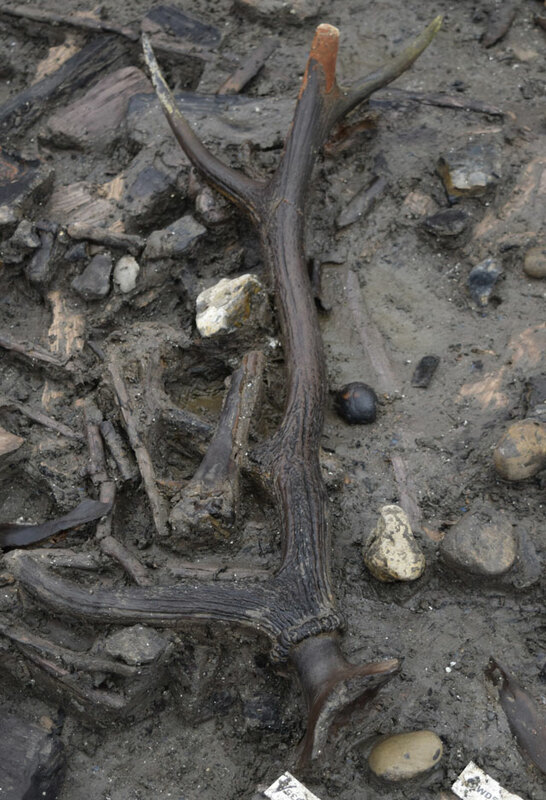 Antler still attached to a deer skull found alongside other fragmentary material close to the palisade in the eastern area of the settlement. The eastern area had a reasonably well-preserved area of wattle panel that looks to have come from the nearby structure to the west. The panel was much smaller than the example that survived from Roundhouse One in the central section of site, but was in remarkably good condition. Recording these fragile structural elements is not easy and involves a combination of photogrammetry and scale drawings. We are particularly interesting in seeing how this panel compares with the other wattle elements we have found on the excavation. Will the techniques and wood species used in their creation be the same across the site? Or could they differ between the structures? 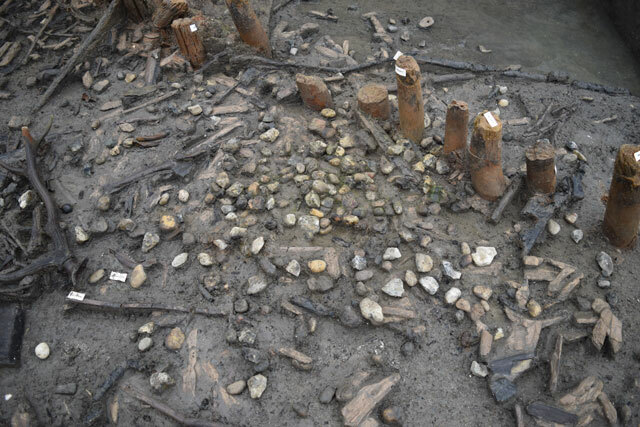 One of the more unusual elements of the excavation we have discovered so far belongs to the eastern area: a fairly concentrated spread of stones just inside the palisade. After excavating further, this cluster of fairly small stones extends slightly beyond the palisade. We’ve received a wide range of suggestions on why these stones are here. 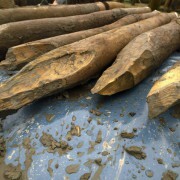 One of the most prominent theories put forward is that they are a cache of ammunition for a slingshot positioned on the edge of the palisade for defensive purposes. However, we aren’t sure this is the case as the size and condition of many of these stones are not at all consistent with sling stones. Area of mostly small-sized stones grouped around the inside of the palisade. 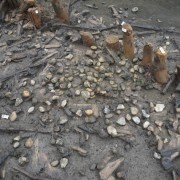 These small clusters of stones are occasionally found elsewhere on the site. We have also begun to discover more groupings of similar stones elsewhere on site (including in the central area and a small cluster in the western extent of the site). In each area they seem to consist of a variety of sizes and some display evidence of heating that does not necessarily come from the fire that burnt down the settlement. Our working theory, which may change, is that they may have been “pot boilers”: stones that were heated and then placed in vessels for a range of activities, including cooking. 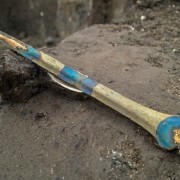 The other key element, which is only beginning to emerge as we excavate more, is that there is an abundance of material associated with the construction of the palisade. 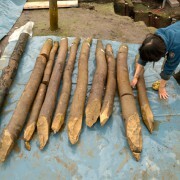 This material largely consists of dozens and dozens of ash woodchips and larger pieces of timber debris, removed as part of the process of shaping the uprights. Cleaning and recording such a dense mass of small and delicate woodchips is a time-consuming process but one which will help provide more insight into the creation of the palisade which enclosed the settlement. Image showing the density of wood, both destruction and construction related, in the eastern area. Recording this is not always straightforward! What Do the East and West Areas Tell Us About Must Farm? As the excavation nears its conclusion we will be constantly improving our understanding of these zones at the edges of the site. 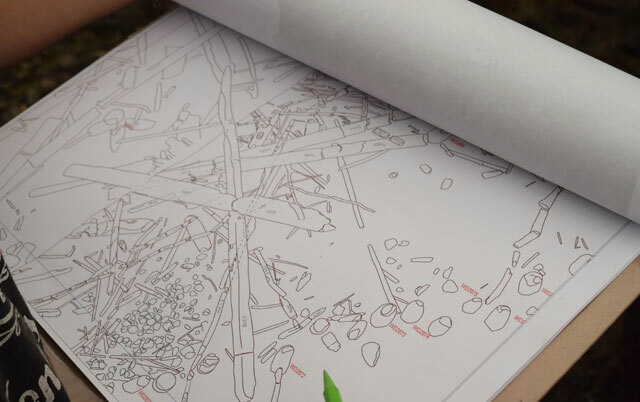 Working through the occupation material will give us a greater understanding of the activity taking place close to the edges of the settlement. Are there noticeable differences in what was happening close to the palisade compared to the houses in the middle of the settlement? While it is hard to answer that question at this stage of the excavation we do know that there was activity going on close to the edges of the settlement. There is construction debris, some occupation material and timbers all the way up to the edge of the palisade. The buildings closest to the outside of the settlement, such as Roundhouses Three and Five, definitely have material and seem very comparable to the homes elsewhere in the settlement. Comparing these structures during post-excavation when we can really use the details of complete assemblages will be particularly fascinating. Outside the palisade at the eastern area of site there is very little material. 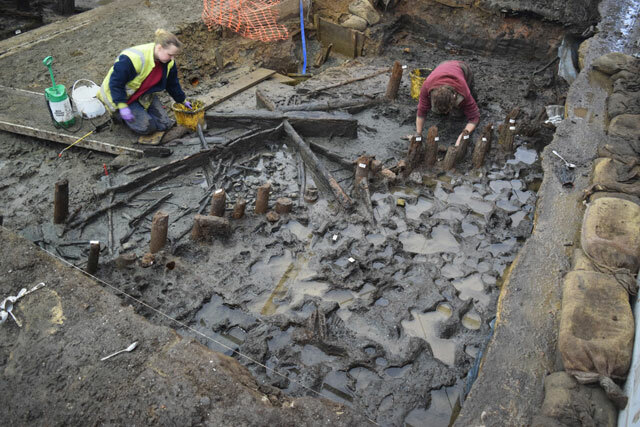 Was the debris from the settlement contained by the palisade? 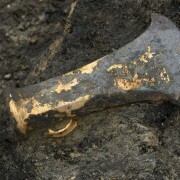 The eastern and western areas of site also highlighted another key aspect of the archaeology: outside of the palisade activity associated with the settlement appears to stop. Beyond the extent of the palisade there is very little material, including construction debris. This is very interesting and we are keen to examine this trend in more detail. The only archaeological activity outside the extent of the settlement seems to either pre or post-date the lifespan of the homes. The large, timber causeway which runs diagonally across the settlement dates to at least 200 years earlier than the houses. 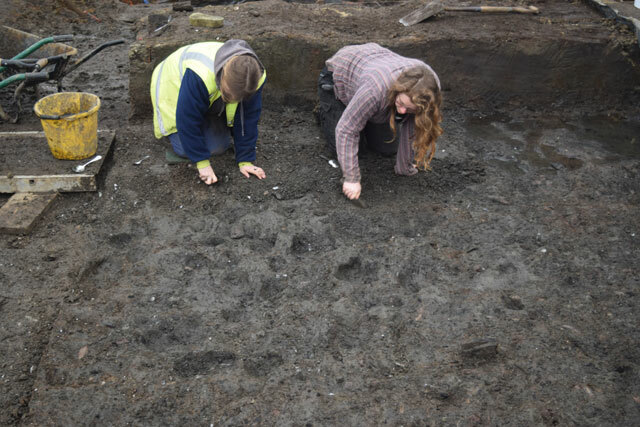 Similarly, the foot and hoof prints in the sediments beyond the palisade seem to post-date the fire, when the rest of the site seems abandoned. We still have many questions to explore in the final few weeks of the excavation and continuing to work in the eastern and western areas will help provide useful information to assist us. The Must Farm settlement is one of the most complete Late Bronze Age examples known in Britain. Understanding the entirety of the settlement, not just the buildings and their contents is crucial to the success of the project. Exploring the eastern and western areas is one of the most important methods we have of developing a more comprehensive picture of the Must Farm settlement. Over the coming months we are all very excited what other surprises and finds these outer areas will deliver.